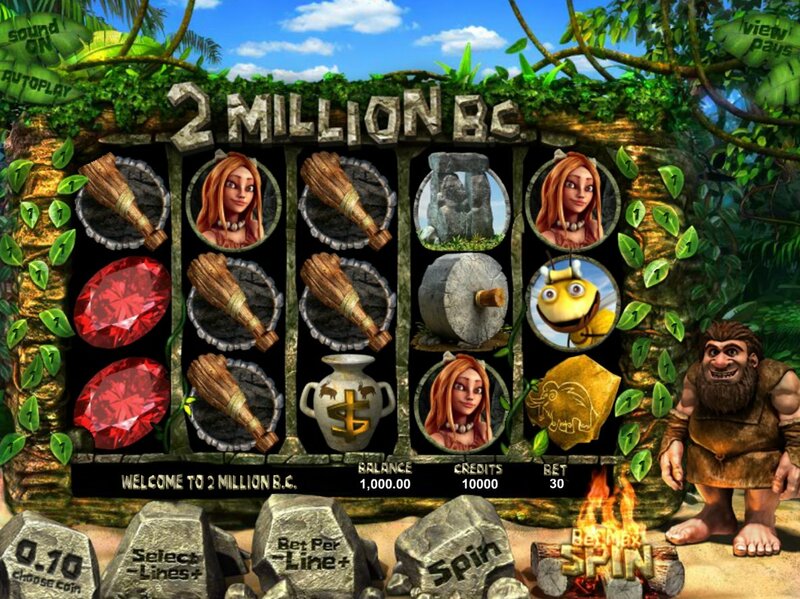 Quirky cartoon characters, s jolly soundtrack, plenty of background FX, and some slick gameplay: yep, we’re back in Betsoft Gaming 3D territory again as we travel back to the Stone Age with 2 Million B.C. A 5 reel, 30 pay-line video slot, there’s a 7,500 coin jackpot up for grabs in the game, and some really nice bonus features. Betting starts at just $0.02 a coin. On the reels are some lovely icons looking like an offshoot of kids’ cartoon comedy, Ice Age. There’s the customary sabre tooth tiger, cave paintings, the first wheel, some Stonehenge-style structures, a stone necklace, and a red ruby. There’s also the caveman’s brunette wife and what looks like a big hornet. There’s some lovely animation when you hit a winning combo – particularly three or more Stonehenge symbols which sees our hapless caveman run headlong into the stones and knock it over. 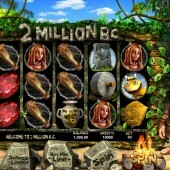 All the while – in true Betsoft style – our caveman hero stands at the foot of the reels cheering after winning combos hit. All cavemen were out to discover fire, and it’s the fire symbol (Scattered) that earns you free spins. Just hit three or more on the reels to activate the round. Additional free spins can be triggered by hitting more Scatters. If you hit acorns on the reels our friendly hornet will take off with them and stash them on the side of the screen. Once he’s gathered three acorn symbols he’ll trigger the ‘Saber Attacks’ feature. Help the caveman aim at and shoot the nasty sabre tooth tiger (with your acorn horde, obviously) in order to win cash. Finally, hitting three or more diamond Scatters across the reels unlocks the Diamond Bonus. Essentially a Pick ‘em bonus round, you’ll have to pick methods of stealing the valuable diamond from that pesky tiger. With some really nice graphics, great animation on the winning combos, this is a game worth ‘hunting’ out. Check out any of Betsoft’s other great 3D games such as the crime-themed A Night in Paris, while for more BC-hunters, Sheriff’s slick 3D effort, the prehistoric-themed Dino's Rhino, is worth a look.